A few days ago we announced Downtown Dental now offers WaterLase iPlus Laser Dentistry which provides injection-free, pain-free dentistry for many of our procedures including fillings, whitening and gum disease prevention. Since our announcement, we’ve heard from several patients who are excited to try the new procedure at their next visit. Not surprisingly, many of them have asked the same question, “So how does it work?” At the same time, we realize that some of you might be skeptical of the pain-free WaterLase iPlus Laser. Today, we are providing a quick reasoning of how and why it works. To understand why most dental work is painful, we must first understand how pain impulses work. Any pain you experience is caused by an electrical impulse that moves through nerve fibers from the source of the pain to your brain. This impulse is a result of different ions moving into and out of the nerve fiber cells through gates. When something hurts, the gates open, ions move, and the pain impulse starts. One way the WaterLase iPlus Laser prevents pain is by it’s energy temporarily closing the ion gates. If the ion gates cannot open, no impulse can travel to the brain to be perceived as pain, thus providing anesthesia. The WaterLase iPlus Laser avoids contact and friction. While the Laser provides a natural anesthetic, it also helps prevent pain and shots with a new, frictionless method. A normal dental drill works with friction, which causes heat and triggers pain. This leads to painful visits to the dentist and/or visits that leave your mouth feeling number after receiving anesthetic shots. 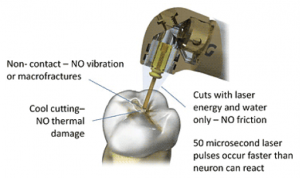 The WaterLase uses a unique, powerful interaction of the patented YSGG laser wavelength along with trademarked water/air spray that cuts, etches and shapes target tissues without contact to remove tooth structure and decay. This means there is no heat, friction or pressure to cause the nerve to fire an impulse to your brain. The procedures can be done painlessly with no anesthetic. Because there is no friction, there is no pain or reason for anesthetics. Because the laser acts as an anesthetic, there is usually no need for a shot, which means leaving the doctor’s office without any numbing. Its non-contact method will guarantee you won’t feel any pain even after the procedures is finished. If you want to know why we’ve invested in the future of pain-free dentistry, read this. If you want to make sure the WaterLase iPlus Laser is used during your next dental appointment, simply let us know when scheduling your next appointment. For more information on WaterLase and how it works, click here.